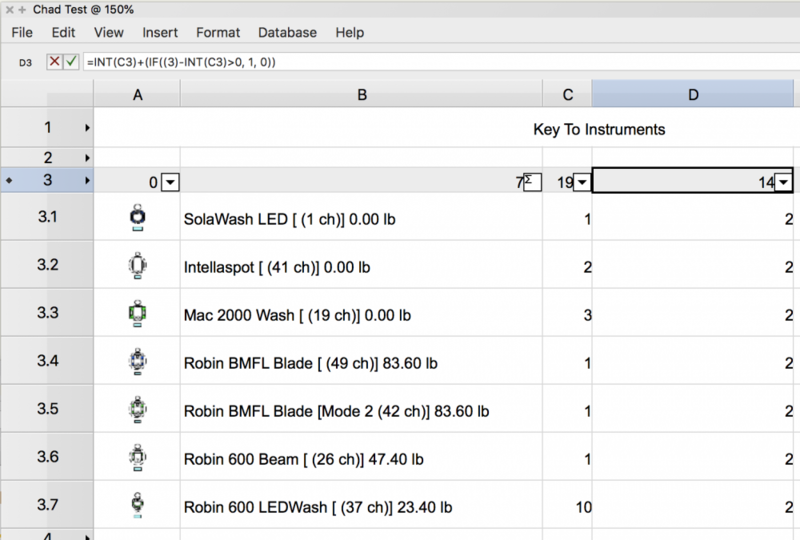 I'm trying to create a worksheet that auto calculates spare lighting fixtures. 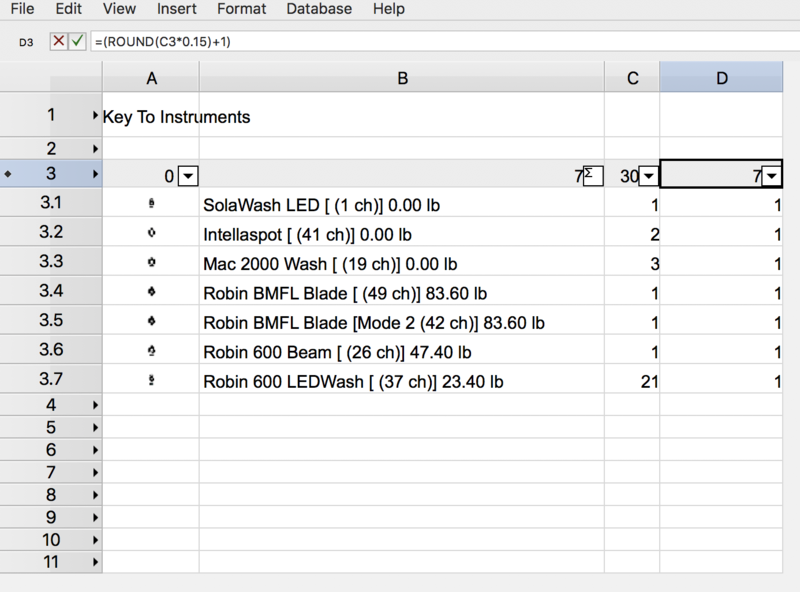 So far I have it setup a database row that shows symbol image, instrument type, count per fixture. 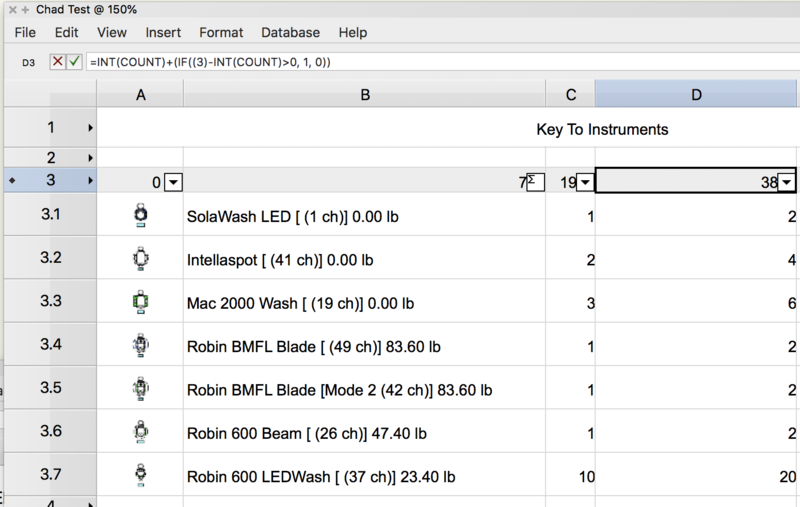 I want to add a column that calculates spares. I want the spare fixture count to be 15% of the total count. I would also like this number rounded up to the nearest whole number. For example, if I have 5 fixtures, instead of the column saying .75, I want it to say 1. I have tried using the Round command. I've been trying =(Round(C3*.15)+1). In my head that should get me a minimum of 1. 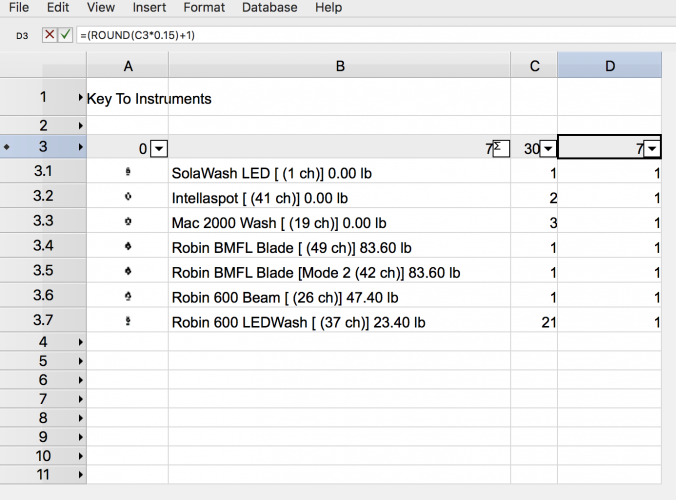 What always seems to happen is the formula is calculated on the total of all the fixture below, instead of each row. See Image. My next question is, how do I set the row height for the cells in 3.*. I know I can select the cells and change the height, but I want to change the default height for those cells, so anytime I add a fixture to the drawing it gets added at the correct height? What is D3 and E3 in your example? After messing around with the INT, and IF statements, I have not been able to get the desired result. I think I need to include the =COUNT function in the equation, because otherwise it seems to just be working off the total count of all items below. However any time I try to modify the COUNT beyond a simple math equation, I don't the desired answer. both of those result in the original count. I feel like I'm getting close, but I'm missing something here. The number I would be going for in cell 3.7 is 2 (1.5 rounded up), and 1 in 3.1-3.6. I think this is doing the calculation on the value in the C3 cell, and not the C3. * cells. And that is part of the problem I am having. I think have to include COUNT in the formula somewhere, but I can't seem to figure out how to make this work. Do you want to send me the file? I think I've figure out what my problem with the COUNT function is. Let me know if this is working as designed. If this is working as designed, how would I do addition or subtractions? sorry to disturb the "high level worksheet configuration discussion" at this point, but to my experience the amount of spare units usually does not follow exact mathematical rules,- its often a question of availability and/or transportation space. So my general "quick and dirty solution" for spare parts is simply to drag and multiply them on "spare parts layers". In that way it is even possible to generate spare part lists and/or general packing lists including or without spare, and as well make different layers and worksheets for different cases/transportation units. It is true that there are more things involved in spare quantity than simple math, but it what I am trying to have the worksheet do is generally what I am going to ask for.